Do you need to backup your MySQL database via SSH / SSL connection? 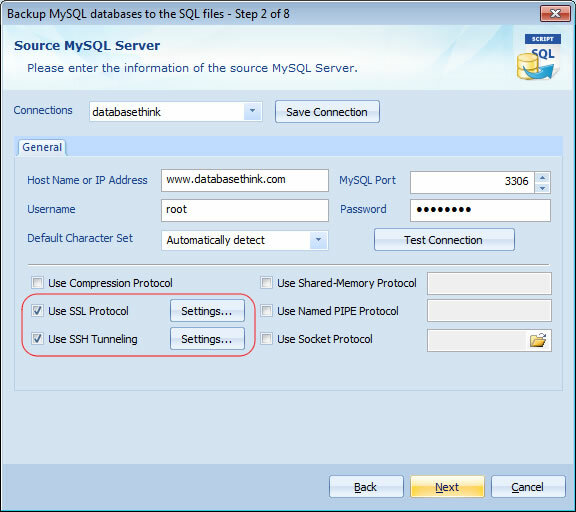 Our software MySQL Backup SSH SSL will help you to schedule backing up and restoring of MySQL database with SSH tunneling / SSL protocol. The software can be used to backup MySQL databases on Windows, Unix, Linux, Mac OS and all servers. Key Features MySQL SSH tunneling and SSL protocol supported. MySQL SSL CA Certificate, Cipher, Client Key, Client Certificate and Verify Server Cert supported. MySQL SSH password and private key supported. MySQL SSH HTTP and Socks proxy server supported. Easy-to-use Windows GUI interface. Automatic Backup MySQL with Scheduler. Backup all items of MySQL ( Tablespaces, Databases, Tables, Views, Triggers, Stored Procedures, Functions, Events, Indexes, Primary Keys, Foreign Keys, etc. ). Backup all character sets of MySQL ( Unicode, UTF8, etc. ). Backup all table types of MySQL ( InnoDB, MyISAM, BDB, etc. ). Backup all field types of MySQL ( BLOB, TEXT, VARCHAR, DATE, DECIMAL, etc. ). Backup the newly-created and updated items ( CREATE, DELETE, etc. ). Support connection via TCP/IP, SSL, SSH, Compression, Shared-Memory, Named Pipe, Socket protocols. System Requirements Runs under Windows 8, Windows 7, 2008 Server, Vista, 2003 Server, XP, 2000 and latest version. Supports MySQL from 4.0 to the latest version ( MySQL 4.0, 4.1, 5.0, 5.1, 5.5, 6.0, etc. ). Supports MySQL server run on all Operating System ( Linux, UNIX, Windows, MacOS, etc. ). This site does not contain serial number, crack, keygen MySQL Backup SSH SSL serial number : serial number is the simplest type of crack. A serial number(cdkey,product key,etc) is register the program as you may already know. a crack or keygen may contain harmful software. If you cannot find the exact version you want, just give it a try. for more information read .nfo/.txt/.diz file include in zipped file.